My new fabric line – Mighty Pines – from Northcott has arrived! It’s in the stores! I just love it! Not only is the center panel a wonderful reproduction of the quilt that inspired the line but the coordinating fabrics that are part of the line are also wonderful, Deborah Edwards at Northcott is a master at adapting a quilt design into a line of coordinating fabric. I saw the line for the first time in person when it arrived at a shop I was teaching at about a week ago. Where did that term come from? The first time I ever heard it was in the movie ‘The Wizard of Oz’ but the context left no doubt that it was already a phrase in common use. But I digress, this may not be a horse but rather a non-traditional rainbow. Just look at what I picked up at Quilt Market last weekend in Portland. 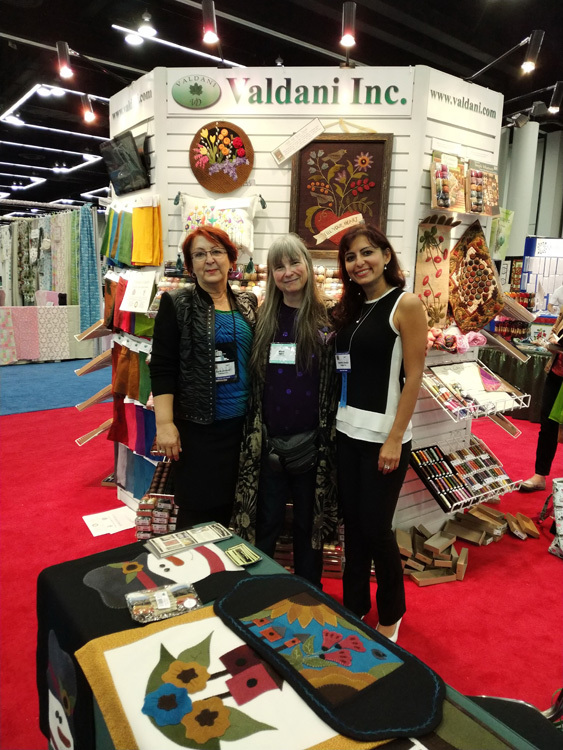 I visited the Valdani booth where I had a lovely chat with the owner, Dana, and showed her some of my embroidery; one of her helpers in the booth took this picture of me and the rest of the Valdani staff there. I love Valdani threads and have been using them since I first discovered the 35 wt quilting thread in a little shop in St. Helen’s Oregon about a decade ago. 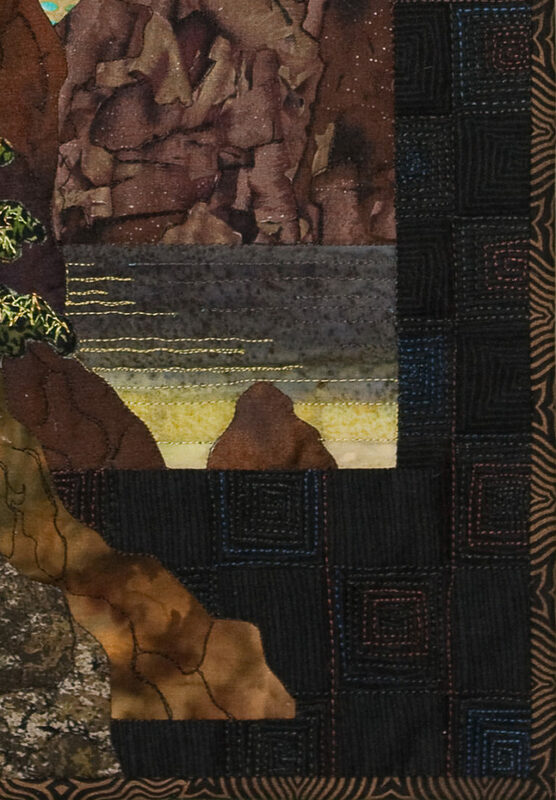 they make luscious variegated threads in color combination you just don’t see elsewhere like one blend they called Cold Lava – a blend of black, sapphire blue and a rich rust color that quilts up beautifully (see the close up of a border below). 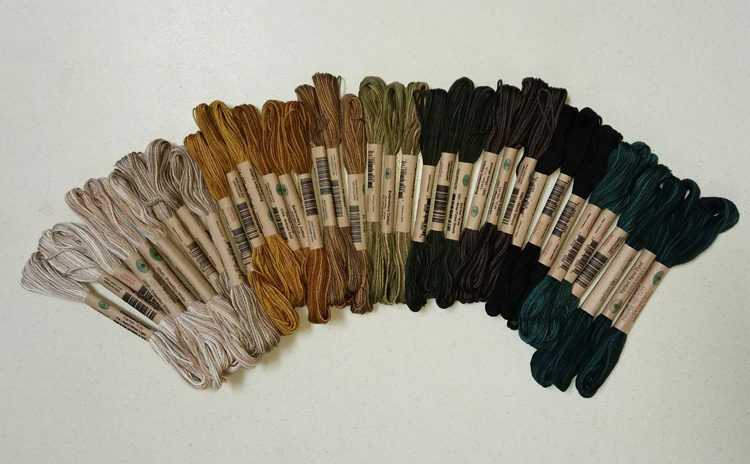 At the show, I bought a few new colors of the quilting thread (what – they actually have colors I don’t already own???) but mainly I added to my collection of embroidery floss. This six-strand cotton floss is soft and silky in texture and the variegation subtle which I prefer as opposed to drastic color shifts that can make the work look splotchy. Valdani also makes this floss available in three-strand balls for punch needle and other work where a finer floss would be preferable. I can’t wait to work these into a project. OK gentle readers, the proverbial ‘cat’ is out of the bag. I am proud to announce that I have now joined the ranks of fabric designers with a new line of fabrics produced by Northcott to be featured at Fall Market in Houston at the end of this month. Northcott approached me this past spring about using some of my quilt designs to produce printed panels with some coordinating textures and supporting fabrics by Linda Ludovico to create the line we are calling Maplewood inspired by one of my Garden Window quilts. Those of you who know me well have been aware of this but for my general followers, I have had to keep a bit mum about this until Northcott was ready to present the new line on their website, this has been a bit hard to do as I’ve been so excited about it. You can view the collection at Norhtcott’s Maplewood page along with some stunning quilt patterns made by their pattern designers utilizing the fabric line. Several of the local quilt shops where I teach are already planning to pick up some of the fabric and have even asked if I might come do an autographing the fabric panel event, I will keep you posted if we do that. 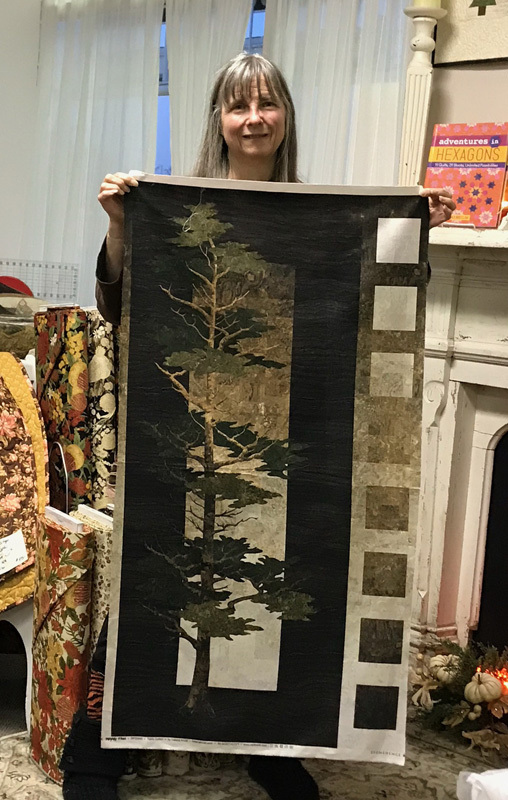 The Garden Windows quilt that has been reproduced for this is my latest one ‘Clothed in Crimson’ and I’m posting a picture of it here; if you visit Norcott’s page you can see the lovely reproduction they have created of it, I am truly amazed how well it has turned out. Meanwhile, I have self published a pattern for the quilt, which is available at a couple of the local quilt shops – A Common Thread and Pioneer Quilts, these are also shops where you should be able to find my fabric very soon. ‘Clothed in Crimson’ my quilt that has been reproduced as a printed panel by Northcott Fabrics.